» Roadside junk: Any answers? Until now, this spot along Oak Grove Drive in Benton County didn’t look like a trash disposal site. Here’s one of life’s vexing questions to which we need a better answer, or any workable answer at all: What do we do about people who leave their trash along our public roads? Clearly something has gone wrong with these folks. And it’s probably too late to fix it. In any case, the people who toss their junk — or leave it, carefully arranged, out of the driving lane — do their thing when no one is around, and in the country we don’t have surveillance cameras everywhere, which is a good thing. So we can’t find anyone to blame or to call to account. 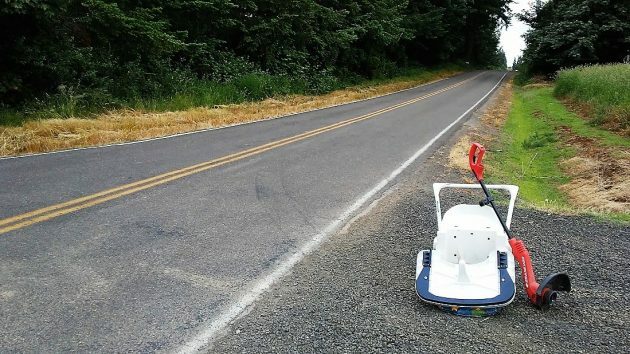 Benton County has signs on some roads threatening people who litter with fat fines. If there’s ever been a case of a roadside litterer being fined, I’m not aware of it. Of more immediate concern is what to do with the roadside trash we come across. Now and then, some citizens take plastic bags and a pick-up tool with them on their walks, collect some of the smaller bits of debris and add them to their trash cans when they get home. But yard implements, children’s high chairs and other unwieldy stuff? Somebody with time on his hands and a truck might take these things to the dump, but the stiff minimum fee they charge makes such a good deed way too expensive to become a regular thing. Well, this is an apropos post Hasso. We awoke Saturday morning to a couch abandoned on the sidewalk in front of our house downtown. As we live downtown, we are accustomed to disposable cups, bottles, and wrappers in the street in front of our house. I generally just pick it up an put it in our trash. However, a couch is another matter. I was going to phone Republic services and pay to have it picked up. My wife wa a bit smarter than me, and was a bit incensed that we would have to pay to dispose of another person’s couch. She phoned the city first. The city said that they would contact sanitation instead, and they should pick it up sometime this coming week. It sounds like city (or Republic?) will pick up the tab. We will let you know what happens. In any case, I compliment the city of Albany and Republic services for helping us out here. I expect this is one of the many unseen services that the city and Republic get done that we seldom think about. Thank you Public Works Department of Albany. I received an phone call on Wednesday. The fellow (I don’t recall his name) said they’d pick up the abandoned couch sometime this week or next. They have priorities to balance. I appreciated the call. Then by Wednesday evening the couch was gone. Excellent help from a city employee! I rode by this stuff along the road on my motorcycle yesterday. It struck me as very strange place for some junk that almost looked like it might have some value. It looked like it should have had a for sale sign or free sign on it, but there were no houses nearby. Yes, roadside debris is a real problem. When I was growing up on the coast, the dump was free. (Well, free to drive in and dump, but surely subsidized and supported by tax payers.) When they started charging $3 per load, the discards started showing up on the roadside turnouts. Turn around the throw away manufacturing ( controlled obsolesence) and that junk will dissappear. Reflects more on parenting skills than schools …public, private, charter, home or otherwise.